Description: The clock is ticking as the end of the world approaches, and only the Agency can stop it in time! Race to investigate odd disturbances popping up around London. Research new abilities and how to use mystic artifacts to aid you along the way. Try to uncover what terrible force is behind the darkness creeping into the city, before the entirety of London is consumed by it! 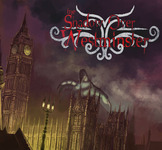 The Shadow Over Westminster is unlike any co-op deck builder you've ever experienced. Varying card backs allow for vastly improved strategic planning - knowing what card type is coming up next allows you and your fellow Agents to make more informed decisions. Players are free to move around the board and tackle challenges however they see fit, but a lack of co-ordination will allow the darkness to creep over the city, and the Cataclysm to be at its strongest. Players take on the role of an Agent. Play as the media-savvy Shadow, the noble Knight Templar, the mysterious Watcher, or the enigmatic Outsider, and employ your unique gifts to aid your fellow Agents. The goal in The Shadow Over Westminster is to save the city (and the world) from the oncoming Cataclysm. At the start, the Agents don't know what the Cataclysm could be, only that it's coming - but as the game progresses, the team can use their research, investigation, and special talents to uncover what doom approaches. The Cataclysm is chosen randomly at the start of the game and placed face down until the Agents have done enough research and investigation to uncover the threat. Uncovering the Cataclysm is only half the battle - once uncovered, the Agents must overcome the Cataclysm's unique effect and drive the evil back out of this world, using the research, investigation, artifact, and talisman cards they've collected throughout the game. With over a dozen cataclysms, who knows what the more malicious denizens of London are up to in the shadows. Scales for 1-4 players to enjoy in 60-90 minutes.